On Monday, November 14th,Wanda Bryant, a middle school teacher at the Henderson Academy in the Detroit Public School system was awarded the Kathy Hayrynen Scholar Award at the ASM International Detroit Chapter meeting in Warren, MI. 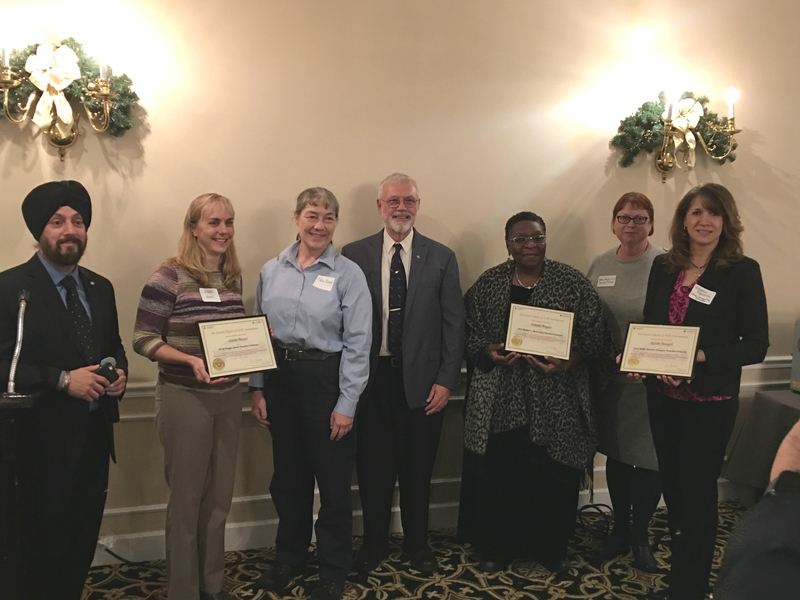 In 2014, the ASM Detroit Chapter established 5 teacher scholar awards to provide grants to teachers who need financial assistance for materials (and metallurgy) related activities in their classrooms. One of these teacher awards was named “the Kathy Hayrynen Scholar Award” to honor Dr. Kathy for 15 years of volunteer service to organize and operate the ASM Teachers’ Materials Camp held annually in Ann Arbor. The Teachers’ Materials Camp is a week-long workshop conducted within the Department of Materials Science and Engineering at the University of Michigan.Its purpose is to introduce basic concepts of materials science to both middle school and high school teachers.The emphasis is on low cost, hands on activities for math, science and technology students. ASM International is the professional society for Materials Engineers. It has 90 Chapters worldwide with a membership of 29,000.Congrats to all award recipients! Pictured L to R: J.P. Singh (ASM Detroit Chapter Chair), Laura Moore (Hartland High School), Dr.Peggy Jones (GM), Dr. William Frazer (ASM International President), Wanda Bryant (Detroit Public Schools), Dr. Kathy Hayrynen (AP) and Karen Forsyth(Utica Public Schools).